With increasing demand for workforce optimisation and interaction, the unified communication and collaboration market is poised for strong growth. Growing at a CAGR of 12.4%, the Indian Unified Communication market is expected to reach USD1,506.2 million by 2018. Driving this growth are Voice based unified communication solutions which have secured a major portion of the market revenues in India owing to their affordable pricing and ease of usage. However, Conferencing unified communication is emerging as the fastest growing UC market in India and is expected to gain pace on account of a surging demand for video conferencing solutions. In order to keep pace with this exhilarating growth, organisations are now looking to leverage new capabilities in communications in a big way. Cloud-based unified communications platforms are growing in popularity with SMBs that want the ease of customization, and cost-effectiveness that a third party hosting service provides. 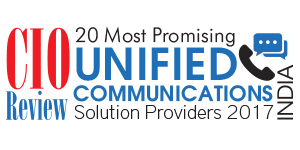 Among these platforms, Unified Communication as a Service (UCaaS) is turning the tables in enterprise operations by removing the barrier of front-loaded capital costs and greatly improving the bias for action within a CIO’s office. Significant technological developments such as voice-over-internet-protocol (VoIP) and integration of Public Switch Telephone Networks (PSTN) are also enhancing the Mobile Unified Communications and Collaboration solutions segment. While the above trends create a stronger proposition for businesses to adopt UC, Indian enterprises still encounter infrastructural and organisational challenges while integrating these solutions into their environments. With an objective to address the crucial need of CIOs to find the ideal UC Software, CIOReview identifies “20 Most Promising UC Solution Providers in India”. Being closely scrutinized by a distinct panel of judges including CEOs, CIOs, CXO, analysts and CIOReview editorial board, we believe that these companies can understand the unique demands of the market and deliver solutions that encompass new technologies to satisfy the demands of the voracious and outspoken consumer. We present to you CIOReviewindia 20 Most Promising UC Solution Providers in India - 2017.